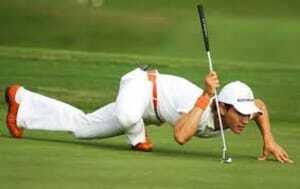 How Is Your Golf Flexibility? Here at Pilates Plus, most of the people who come to us for help do so because of issues with flexibility and mobility…and core strength. Now you can’t have great core strength without flexibility and you can’t have great flexibility without great core strength! So doing a few stretches before you play golf might loosen your muscles off a bit, but they will inevitably tighten up again if you haven’t addressed the underlying core strength issues that are leading to a lack of mobility and flexibility. Now if you are a golfer, it would be easy to assume that to gain more flexibility you need to do a lot of work on your upper body and rotation…and that would be correct. But when we do a postural assessment for a golfer, the first thing we look at is the hips and pelvis because if your hips are tight and weak, then you will not have the ability to rotate your upper body effectively. If you are really serious about developing your flexibility and mobility, then you need to have a structured, progressive flexibility program that you do over a minimum 12 week period. For some people, gaining flexibility can take up to 12 months or more, depending on the underlying core strength issues present. But the good news is that you really can get great flexibility if you are dedicated, persistent and determined, which are all qualities that I’m positive that you apply to your golf game any way! Check out this little video which gives you a quick hip stretch to do anywhere, anytime. If you can’t get your leg to a 90 degree angle, or can’t get it up at all…then you have some flexibility issues that need addressing. The Pilates Plus team are dedicated to helping you achieve your golf flexibility and mobility, so book a FREE Golf Posture Assessment and 2 FREE trial Pilates classes and see how we can help you. There’s no obligation, we are just happy to introduce you to the amazing Pilates method of movement.